The Washita Battlefield National Historic Site is aproximately 45 minutes from Elk City. Admission is free. Hours may change, depending on holidays and season, so make sure to check their website. The visitor center does have limited RV parking. If you ask, the park rangers at the center will show you to a small auditorium where you can watch a film about the Washita Battle. The Washita Battle or, more correctly, the Washita Massacre, occurred on November 27, 1968. This year marks the 150th anniversary of the battle. General Custer and his men attacked a peaceful Cheyenne winter encampment, killing many, including Chief Black Kettle and the chief's wife. Chief Black Kettle was one of the Cheyenne who had survived the Sand Creek Massacre four years before. Despite the horror of that event, Chief Black Kettle continued to believe in striving for peace, and signed a treaty with the United States. At least 40 Cheyenne were killed and 33 U.S. soldiers. Custer took the remaining women and children prisoner, and they would eventually be released and settled on a reservation the next year. Because Custer and his men burned everything in the camp and killed all the horses (around 800) the survivors had nothing left. Their way of life had been forever destroyed. There are two different walks laid out at the visitor center. One runs through portions of the battle site. The other path weaves through restored prairie, and chronicles the many changes caused by American settlers. We also saw several signs, thanking the local tribes for their help with the creation of this visitor center. We know there has been a push by many park service employees to change how the department traditionally dealt with Native Americans, and we're glad to see a visitor center embracing these changes. We were also surprised, and heartened, to see the Oklahoma land reclamation mentioned in one of the displays. Until very recently, this infamous part of Oklahoma's history has been downplayed. 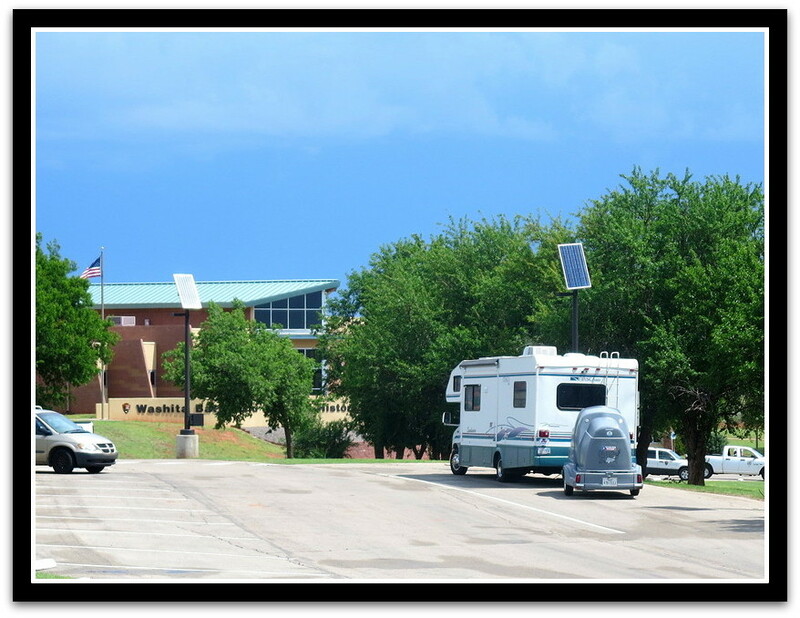 If you are ever on I-40 in Oklahoma, we definitely recommend making a side trip to Cheyenne to see this visitor center.